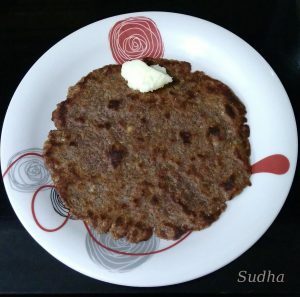 Nachani (Ragi/ Finger Millet) and Rajgira Lahi (Puffed Amaranth) are very nutritious. So I created a pan cake recipe using these two ingredients. This is an easy recipe to make savory pan cakes. To make it more nutritious I added crushed peanuts. For binding I added steamed Potato. Alternatively, You can add boiled Arbi / Alkudi / Colocasia roots / suran (yam) / Kand (purple yam). Thalipeeth turned out to be very tasty. It did not become hard even after 3-4 hours. This can be a nutritious and tasty breakfast option. This could be carried in Tiffin also. 1. Peel and mash Steamed Potatoes. 2. Mix all ingredients except ghee / clarified butter. Bind a medium consistency dough. Add water if necessary. 3. Keep the dough covered for 15 minutes. 4. Take a plastic sheet or butter paper. Apply some ghee. 5. 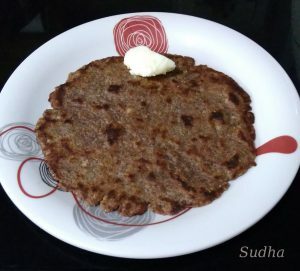 Make round balls of dough bigger than a lemon, keep it on the sheet, dip fingers in water and pat dough with fingers to make a round shaped thalipeeth thinner than paratha / pan cake. 6. 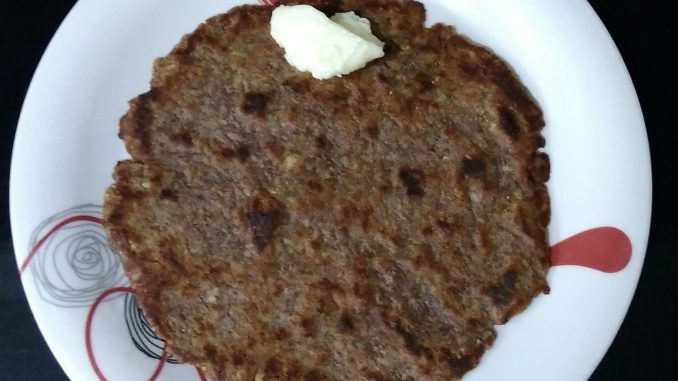 Transfer Thalipeeth to hot non stick gridlle. Put few drops of ghee around Thalipeeth. 7. Cover the griddle and cook for 2 minutes. 9. Add few drops of ghee and cook the other side. 10. Serve hot with Home made butter. Tastes awesome. You can use Jowar Lahi (Dhani / Puffed Sorghum) instead of Rajgira Lahi. Grind Jowar Dhani in grinder and use 1 cup of flour in the above recipe. ही माझी स्वतः ची रेसिपी आहे. नाचणी आणि राजगिरा दोन्ही पौष्टिक आहेत. राजगिरा लाह्या घातल्यामुळे थालीपीठ सुके आणि कडक होत नाही. मुलांना डब्यात ही देता येते. २. वरील सर्व साहित्य एका परातीत घाला (तेल / तूप वगळून ). थोडेसे पाणी घालून पीठ भिजवा. फार सैल नको आणि घट्ट ही नको. ३. एका प्लास्टिक च्या कागदाला तूप लावून छोटा पिठाचा गोळा त्यावर जाडसर थापा. ४. नॉन स्टिक तव्यावर थालीपीठ घालून थोडे तेल / तूप घाला व झाकण ठेवून २–३ मिनिटे भाजा. ५. थालीपीठ परतून दुसरी बाजू ही तेल / तूप घालून भाजा. ६. खुसखुशीत, पौष्टिक राजगिरा लाही, नाचणी थालीपीठ तयार आहे. 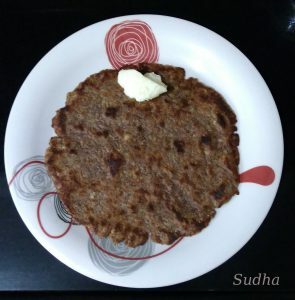 लोण्याबरोबर खायला द्या. १. बटाट्या ऐवजी तुम्ही रताळे (कच्चे किसून / शिजवून) किंवा सुरण (शिजवून) किंवा कंद (कच्चा किसून) घालू शकता . २. राजगिरा लाह्यां ऐवजी तुम्ही ज्वारीच्या लाह्याचं पीठ घालू शकता. लाह्या मिक्सर मध्ये बारीक करून घ्या. वरील रेसिपी साठी १ कप ज्वारीच्या लाह्यांचं पीठ लागेल.